Lower than expected US retail sales saw the rand make gains against the softer dollar on Monday afternoon. 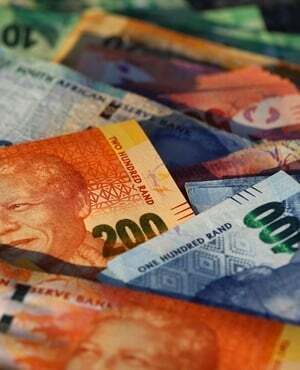 The local currency, which opened at R14.50/$ on Monday, was trading 1.03% stronger at R14.36 by 14:45. According to a market snapshot sent out by TreasuryONE, US retail sales data for September released at 14:30 had come out at 0.1% as opposed to the 0.7% which was expected. "The USD is softer on the back of the print and the ZAR is testing below 14.40," the update read. Trading specialist at GT247 Musa Makoni also shared views that the dollar had weakened and that the rand and other emerging market currencies were strengthening on the back of that weakness. Earlier on Monday analysts noted that the rand had strengthened on news that Moody's did not release a ratings action last week. This week, markets will keep watch of the minutes of the US Federal Reserve Bank's September meeting, which will give indications on its future monetary policy setting, RMB economists Mpho Tsebe and Elena Ilkova said in a market update. This week local retail sales data and mining data will be released. "We expect retail sales to have moderated to 0.3% m/m in August, following the 1.3% and 1.8% increases in July and June," the update read. "We expect mining production to have recovered slightly, increasing by 1.1% m/m in August, following the 8.6% contraction in July." By 15:15, the rand was trading just under R14.40/$, 0.88% stronger at R14.39 to the greenback. It's day range has been between R14.36/$ and R14.57.